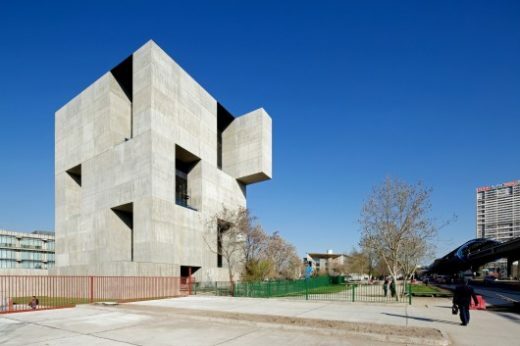 A Chilean university building by ELEMENTAL has won the architecture category of the Design Museum’s Design of the Year Award. The top prize went to the UC Innovation Centre in Chile by ELEMENTAL. 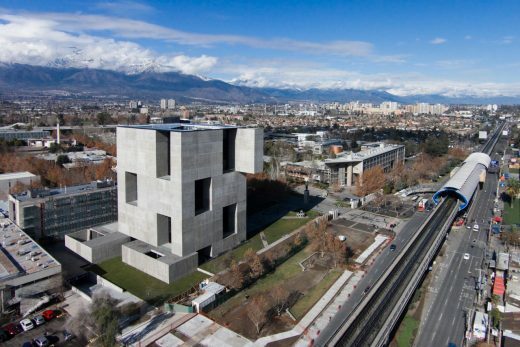 The Chilean firm’s university building in Santiago features walls of thermal mass surrounding internal open air squares. It was praised for creating ‘the right environment for knowledge-creation’. 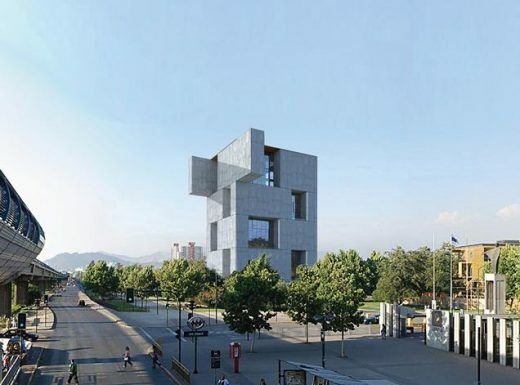 Other contenders include the Philharmonic Hall in Poland by Barozzi Viega, Fondation Louis Vuitton in Paris by Frank Gehry, House for Trees by Vo Trong Nghia Architects, Rotterdam Market Hall by MVRDV and an Istanbul mosque by Emre Arolat Architects. Now in its eighth year, the Designs of the Year award recognises ‘design that promotes or delivers change, enables access, extends design practice or captures the spirit of the year’. The six category winners plus all 70 nominated designs for 2015, are on display in an exhibition at the Design Museum, London which runs until 31 Mar 2016. The overall winner will be revealed on 4 June. Saw Swee Hock Building – O’Donnell + Tuomey’s London School of Economics’ student centre – was the only UK project to make it onto the prestigious list of nominees. This year’s Design Museum Design Awards has been likened to the Oscars of the design world. Showcasing the highlights of the year, the categories include: Architecture, Digital, Fashion, Furniture, Graphics, Transport and Product, with the winners being announced in April. Behind any design, never mind the potentially award-winning ones, there is inspiration. Design is influenced and inspired by the world around us, the issues that plague it and those who inhabit it. But what can the nominees teach us? Below are the cogitations of two architects and one product designer. Sergison Bates designed a care home in Belgium, and is based in the UK. He contemplates the dangers of comfort on his website, saying it leads to a loss of sensation. He says that comfort is considered as a series of insulating layers, and as such, can cut us off from the world. Bates’ work provides these layers of protection, but he claims that these layers do not anaesthetise, they sharpen the senses. They also say that they are not easily influenced by fashion, but by extensive research, led by functionality. McAsian is testament to architecture as part of the changing world – grounded, objective and brave. If we are to take any of this on board within our own lives, it is not to be swayed by trends in fashion – furnish your home with what it needs to function – rather than mindlessly filling it with unimportant trends and upgrading your home insurance. Lastly, but with no less to say, is Jasper Morrison, a product designer from London. On his website, he writes about how he feels uncomfortable within his industry, due to design permeating into everyday situations. He voices his worry about the assumptions of design being ‘inaccessible, overpriced and out of tune with the mass market’ becoming true. He says that the goal to serve industry and making things easier and better to live with, has been side-tracked, describing it as ‘polluted’. This is because, he says, of glossy lifestyle magazines and marketing departments making it a competition for design to be noticeable. He says that the most striking of beauty can be found in everyday situations. Morrison says that he is disinterested by luxury as it excludes other things and was designed to make people feel superior to others. The Design Museum announces the seven category winners for the annual Designs of the Year Awards. The awards celebrate the best of international design from the last 12 months. The overall winner for the Design of The Year 2013 will be announced on Wednesday 16 April at an awards evening held at The Angler, South Place Hotel, London. The Way We Live Now, a season of events, celebrating Sir Terence Conran’s 80th birthday, will be launched with an evening at Tate Modern on Tuesday 20 September 2011, featuring a panel discussion with Stephen Bayley, Christopher Frayling and Fiona MacCarthy. Sir Terence Conran celebrated his 80th birthday on 4 October this year. A major retrospective exhibition exploring his unique impact on contemporary life in Britain is on show at the Design Museum until 4 March 2012. Through his own design work, and also through his entrepreneurial flair, Conran has transformed the British way of life. The Way We Live Now examines Conran’s impact and legacy, whilst also showing his design approach and inspirations. The exhibition traces his career from post-war austerity through to the new sensibility of the Festival of Britain in the 1950s, the birth of the Independent Group and the Pop Culture of the 1960s, to the design boom of the 1980s and on to the present day. The exhibition is curated by Stafford Cliff and Deyan Sudjic. October 6, 2016 in Awards.